Mix thoroughly and marinate for an hour. 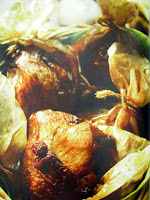 Wrap each piece of chicken in 3-inch square pieces of parchment paper securely with all lose corners tucked in. Fry parchment chicken in deep, hot vegetable oil for 5 minutes. Drain on absorbent paper toweling and serve immediately.